In 330 BCE, Alexander led the Macedonian army into Central Asia to finish off the Persian Empire. In Bactria, now northern Afghanistan, he married his only queen, Roxanne. Yet he did not penetrate the Pamir, the knot of snowy mountains that now forms the western terminus of China. In Alexander’s time, China was in its Warring-states period, when seven large states battled each other among smaller contenders. Qin, the one that would defeat all rivals and create a unified China in 221 BCE, was the westernmost of the warring states. For more than five centuries, the Qin state sat at the gateway to a thousand-kilometer long natural corridor leading west, receiving all western traffic. Not surprisingly the western name “China” was derived from Qin. 1. 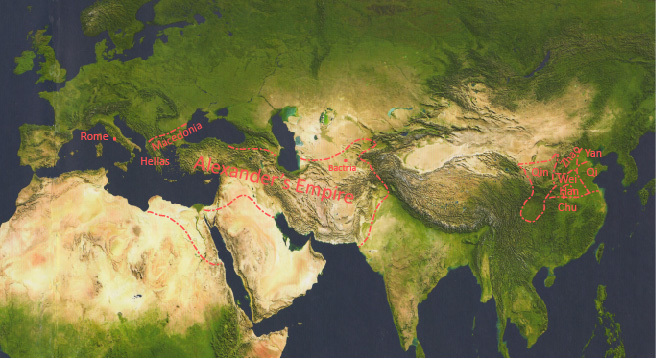 Eurasian geopolitics in the fourth century BCE, when Alexander reached Central Asia. The Qin Dynasty that inaugurated imperial China resembled Alexander’s empire in its short life span. It was succeeded by the Han Dynasty, which lasted four centuries. Imperial China began with a cosmopolitan outlook. The Han dispatched its first western mission in 138 BCE, eagerly absorbed the foreign intelligence he brought back, and adopted a proactive policy toward what it called Xiyu, the Western Territory, today a part of China’s Xinjiang Province. A land of oasis scattered among deserts and mountains, the Western Territory stretched out like an arm, bridging the core of Han China with the lands of Central Asia. It formed a crucial link in the transcontinental trade routes that came to be called the Silk Road. Chinese silk first reached the Mediterranean at the time of the Roman civil wars that marked the transition of the Roman Republic to the Roman Empire. With the rise of conservative literati officials in the Han government, parochialism gradually replaced cosmopolitanism. Litterateurs versed in classical cannons disdained foreign trade, hated defense expenditure, and at the slightest excuses advocated closing the Jade Gate that led to the west and abandoning the allies there to theXiongnu, nomads from the northern steppe. Fortunately, they did not completely smother the open spirit. Defying withdrawal orders, Ban Chao, a low-ranking officer, refused to betray allies in the western territory. He stayed, mobilized local forces, and after two decades of struggle reopened China’s communication with western states. In 97 CE, as Protector General of the Western Territory, Ban sent his deputy Gan Ying in quest of Daqin, the Roman Empire as it was called by the ancient Chinese. Gan reached Mesopotamia, but was discouraged from crossing a great sea by sailors presumably Parthian. He came eighteen years before Trajan invaded Mesopotamia and brought the Roman Empire to its maximum expansion. The missed chance would not be repaired, as both the Roman and Chinese empires soon passed their summit. 2. Eurasia geopolitics in the first century CE, when the Roman Empire and Han China coexited with Parthia and Kushan. The yellow dots denote transcontinental trade routes later known as the Silk Road. Sixty-nine years after Gan’s futile northwestern track and five years after Marcus Aurelius Antoninus succeeded Antoninus Pius, a self-styled Roman imperial envoy landed at Rinan, today’s central Vietnam then the southern tip of the Han Dynasty. The Chinese were dubious, although not for his approach; they knew about the land and sea routes. Fan Ye wrote in The Book of Latter Han: “King Andun of Daqin sent an envoy to Rinan and presented ivory, rhinoceros horn, and turtle shell . . . The insignia being ordinary and the tributes lacking anything precious, the envoy was suspect.” His summary of The Account of Western Regions that included Daqinmentioned Gan Yin but not this envoy, whose gifts were available in Southeast Asia but not on its long list of Daqin products. Royalties readily recognized each other, and this one did not smell right. The Han had experiences in other cases, “the envoys were mean merchants who, desiring profits, pretended to be tribute bearers.” The Romans left no trace of sending emissaries with Serice. Regarding themselves masters of the world, they had no habit of sending diplomats, not to mention initiating diplomacy. Modern scholars mostly agree that the fellow who visited Rinan and several like him later were not state representatives but adventurers who borrowed the name of an emperor too remote to know the offense. Failed or faked, these were the recorded attempts at official contacts between the Roman and Han Empires. Indirectly, however, they were linked by trade, germs, and continental geopolitics. Imperial peace and consumption encouraged patchworks of long-distance trade, overland and maritime, which developed over centuries into the Silk Road.
. Houhanshu 88: 2919-20, 2931.